This weekend, the Mayworks Festival comes to a close, a bird-watching hike celebrates World Migratory Bird Day, The Hockey Sweater come to life with an orchestral performance, a comedy-driven benefit features tons of talent, and more. This weekend, catch two performances of The Hockey Sweater as interpreted by a symphony orchestra. Illustration by Sheldon Cohen. FILM: No, this isn’t an opportunity for you to see The Avengers via illegal methods: the Bootleg Film Festival is actually a travelling festival (it’s been to Scotland, South Wales, and England) that celebrates indie and underground filmmakers. And with Hot Docs in the rear-view mirror, consider this the perfect way to whet your film-loving appetite for an extremely affordable price. TRANZAC Club (292 Brunswick Avenue), Friday to Sunday, times vary, PWYC. MAYWORKS: Where can you find music, spoken word, theatre, visual arts, workshops, and more all in the same festival? Why at Mayworks of course. The festival of working people and the arts is closing this weekend so be sure to check it out some of the remaining highlights, which include: a workshop on decolonization, a screen-printing workshop, an exhibition on the theme of loneliness, and much more. Various locations, Saturday and Sunday, times and ticket prices vary. BIRDS: The arrival of World Migratory Bird Day can only mean one thing. If it’s finally warm enough for the birds to come back, then summer must be here to stay. Celebrate the occasion with Flock ‘n Walk: an eight-kilometre walk where you’ll get to tour Tommy Thompson Park as well as learn about and observe the birds at peak activity (the park has recorded more than 300 types of species). Meet At Tommy Thompson Park entrance, Saturday, 7 a.m., FREE. MUSIC: You don’t get much more Canadian than this. 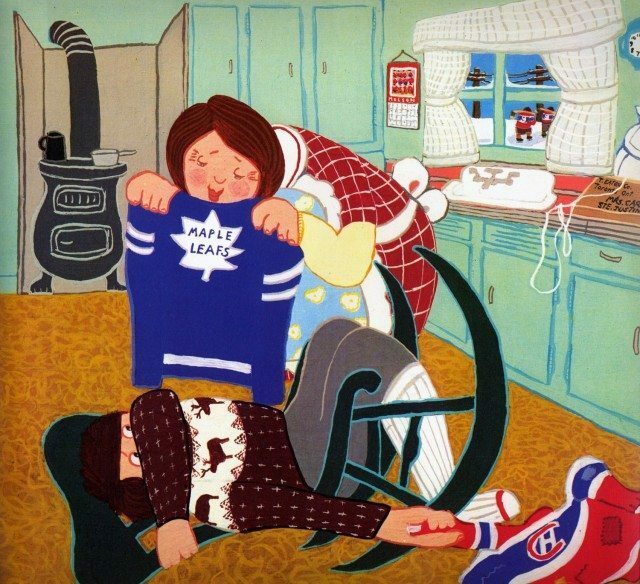 The Hockey Sweater, a newly commissioned work from the Toronto Symphony Orchestra, takes inspiration from the classic story from Roch Carrier (who will also narrate this piece). The composition by Abigail Richardson will feature projections of illustrations from the story itself and will run for two performances only. Roy Thomson Hall (60 Simcoe Street), Saturday, 1:30 p.m. and 3:30 p.m., $20–$32. COMEDY: There aren’t a whole lot of comedy-driven benefit events out there for neuro rehabilitation, which makes Brainsgiving all the more special. This fundraising event (where 100 per cent of the proceeds are going to Toronto Rehab) features the talents of Ryan Belleville (Just For Laughs), Sara Hennessey (four-star Toronto Fringe Festival performer), The National Theatre of the World, and many more. O’Grady’s on College (171 College Street), Saturday, 8:15 p.m. $20. BOOK READING: If you were among the many who were dazzled by the theatre production of War Horse, be sure not to miss this one-night-only appearance from the original novel’s author, Michael Morpurgo. Morpurgo will be joined by Juno Award–winning singer-songwriter Melanie Doane, who will perform songs from the show. Proceeds from this event will go to First Book, an organization that helps children in need gain access to new books. Princess of Wales Theatre (300 King Street West), Sunday, 7 p.m., $15. Urban Planner is Torontoist‘s guide to what’s on in Toronto, published every weekday morning, and in a weekend edition Friday afternoons. If you have an event you’d like considered, email all of its details—as well as images, if you’ve got any—to events@torontoist.com.